Here is a photo of my latest project. The free leaflet I received from the yarn group that I belong to. It is on my side bar called RA_Yarns n' More. 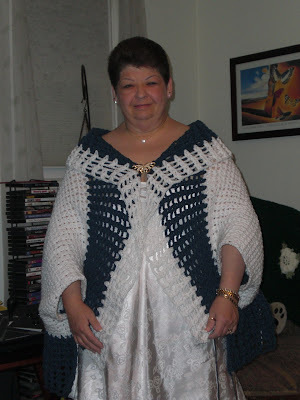 I had fun doing this and I used a heavier weight yarn then called for and also a different size hook. I used Caron worsted weight acrylic in White and Cape Cod. I used an "I" hook as well. Here are photos of the front and back. I have one more row to do on the bottom and then it will be finished. It was getting late and I wanted to get a photo and post before going to bed. Oh Scarlet! That is so pretty! I can see you wearing that out on the town or just to the store. That is lovely. And looks very warm. The colors would go with many different outfits too. Very pretty when you wear it sis. Better looking than the picture. Thanks for your thoughts on my blog. I will be gone this morning. Love you. 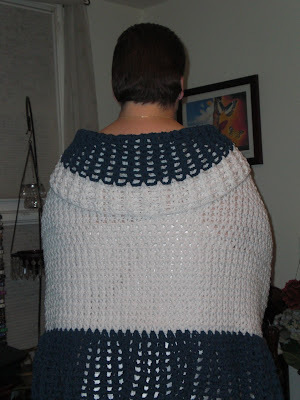 I've always wanted to make a shrug, and yours looks just beautiful! Love it! I have given you two new awards. Now you have to select ten blogs and let them know. Fun Fur and Cotton Purse.